Most galaxies host a supermassive black hole (SMBH) at their nucleus. (A supermassive black hole is one whose mass exceeds a million solar-masses.) A key unresolved issue in galaxy formation and evolution is the role these SMBHs play in shaping their galaxies. Most astronomers agree that there must be a strong connection because of the observed correlations between a SMBH's mass and its galaxy's luminosity, stellar mass, and the stellar motions in the galaxy. These correlations apply both in local galaxies and those at earlier cosmic epochs. But despite progress in studying SMBHs, how they effect their hosts is still not understood. In some suggested scenarios the SMBH suppresses star formation in the galaxy by expelling material. In others, like the merger scenario, the effect is the opposite: the SMBH boosts star formation by helping stir up the interstellar medium. Computer simulations have been undertaken to try to settle these differences, and they tend to show that cold gas flowing in from the intergalactic medium can feed both SMBH and galaxy growth. Star formation is one of the principle markers of galaxy growth. 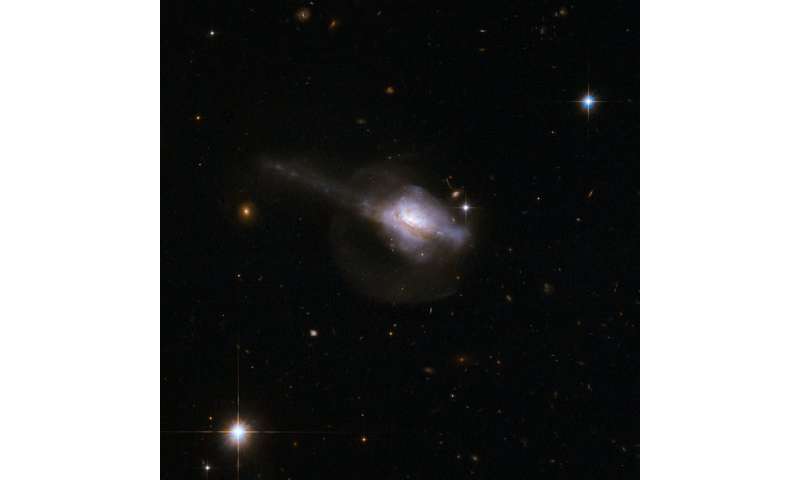 Observations of galaxies have tried to measure the star formation by correlating the formation rate with the intrinsic luminosity (star formation heats the dust whose infrared emission can dominate the luminosity). However, the emission from the region around a supermassive black hole that is actively accreting, an active galactic nucleus (AGN), can easily be confused with the emission from star formation. X-rays or the emission of highly excited ions can be used to determine the AGN contributions independently, but these measures may be complicated by intervening dust extinction or other effects. Furthermore there is evidence that in small or less luminous galaxies, or in those at earlier cosmic epochs, other factors like element abundances strongly influenced the galaxy's development. CfA astronomers Belinda Wilkes and Joanna Kuraszkiewicz and five colleagues examined 323 galaxies known to host AGN from their strong X-ray emission (as measured by the XMM-Newton telescope) and also to have active star formation underway as determined by their far infrared emission (as measured with the Herschel Space Telescope). The galaxies are all at distances such that their light has been traveling from between about two to eleven billion years. Their statistical analysis of the sample finds that on average the AGN contributes about 20% to the infrared luminosity although it can sometimes be greater than 90%. They reach the important conclusion that there is no evidence, at least in this set of objects, for a strong correlation between the two, or that AGNs quench star formation. In fact, it appears that both grow together. There are some very complicated issues of galaxy formation. Unfortunately, here is the same problem as with the stars. The origin of galaxies remains unclear, in spite of huge activity in the field. What the "formation" means? It means that we have the material that is assembling into galaxies. All very well to use the term "star formation" when all current observations confirm that stars do not form all by themselves - none has been spotted so far. According to the standard model, stars CAN NOT form from clouds of gas all by themselves. The physics of the Jeans limit in conjunction with magnetic field repulsion simply prevents stars from forming all by themselves. Hence the need for seeding with dark matter and now as in this article a relief is sought in the tensions created by SMBHs. That just leaves the first stars unaccounted for. And hence the first galaxies. And hence all the rest of the stars and galaxies. They reach the important conclusion that there is no evidence, at least in this set of objects, for a strong correlation between the two, or that AGNs quench star formation. In fact, it appears that both grow together. "This is the clearest evidence we have, in the nearby universe, for black holes growing faster than their host galaxy,"
A Merger Maniac nightmare! And yet for six more years they persist with the head banging. Maniacs, why not just test this inside-out growth model instead? What if it fits observations? Be brave. Dare to actually think.